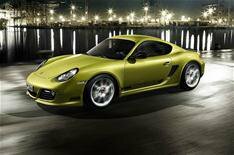 Porsche unveils flagship Cayman R | What Car? Porsche has unveiled a new high-performance version of its Cayman coupe, the Cayman R.
Unveiled at the Los Angeles motor show, the new model is 55kg lighter than the existing Cayman S, but has an extra 10bhp and a sports chassis to make the most of its more powerful engine. According to Porsche, it will provide a 'spectacular' driving experience. The Cayman R uses the same 3.4-litre six-cylinder engine as the S, but uprated to produce 325bhp. With the standard six-speed manual gearbox, thats enough to see the car blast from 0-62mph in 5.0 seconds 0.2 seconds quicker than the S.
However, buyers can trim a further tenth of a second from that time if they specify the optional seven-speed PDK semi-automatic gearbox; and, if they add one of the Sport Chrono packages, the car can do 0-62mph in 4.7 seconds. The Rs maximum speed is 175mph with the manual gearbox (174mpg with the PDK box), while average fuel economy is 29.1mpg or 30.4mpg with the PDK. To further improve the cars performance and sharpen its handling, Porsche has concentrated on saving weight. That includes fitting the R with aluminium door skins, carbonfibre sports seats and the lightest wheels on any of the companys cars. At the same time, Porsche has also removed some equipment, such as the air-conditioning and stereo. The end result is that the R is some 55kg lighter than the Cayman S.
On top of that, Porsche has also revised the cars suspension; dropping it 20mm lower than that of the S. This along with the rear spoiler, silver wheels and details, such as the black-framed headlights gives the R a look that is unique from all other models in the range. The R goes on sale in the UK in February 2011, costing from 51,731 (including VAT at 20%), a price that also includes a Driving Experience at the Porsche Experience Centre at Silverstone.